We are surrounded by technology in our day-to-day lives, so it’s no surprise that technology accompanies us on the hard water. Sonar units have evolved from simple flashers to digital screens and now tablets with GPS features and underwater camera capabilities. 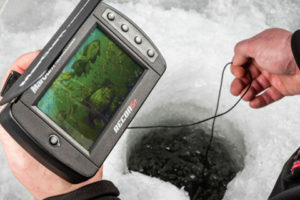 There are also underwater cameras that can wirelessly connect to your smart phone or tablet, and you also can connect them to big screen HD TVs in wheel houses. Of course, a sonar provides a pretty solid image in your head of what’s happening below the ice, but adding an underwater camera adds a whole new dimension. Underwater cameras are nothing new to the ice fishing scene, but how we use them has evolved. Better technology has delivered more compact, user friendly units that deploy them quickly. You can remain fairly mobile while gaining a lot of useful information of what’s lurking below the ice. When I’m using an underwater camera I’m not always looking for fish. Often, I am looking in areas for weeds and checking bottom content to determine the most likely areas to hold fish or have fish travel through them. I am also using the camera to determine fish species and then watch how they react to the lure I am offering. Pay close attention to how your lure responds to your jigging stroke. Subtle changes can result in very different lure action. Take all this information and store it away for when you are fishing without your camera. Remember what jigging stroke it takes to give that particular lure a little extra kick or flare to draw the fish in and trigger a strike. Watch how differently your lures move as you fish deeper. The added resistance on your line from more water will restrict the movement of your lure. Light flutter spoons can lose a lot of action. It may take more aggressive jigging to get your lure to react. You might have to use heavier lures to get the flash or flare you want. Viewing what’s happening below can be entertaining, too. Watching fish in their natural environment can be pretty amazing. See baitfish swim around and watch them retreat before a predator fish arrives. Watch aggressive strikes from pike, or observe just how finicky all species can be. 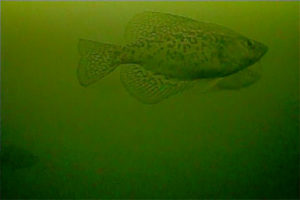 Underwater cameras have many benefits and, used correctly, will improve your angling. Make sure to check the ice as you go. Good luck fishing. Click HERE to check out more hunting and fishing tips by Jason Revermann.